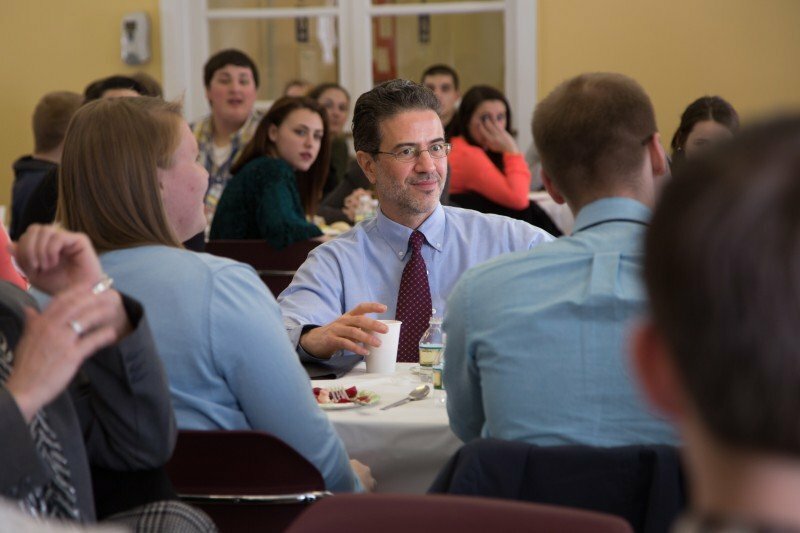 Over 80 high school students, college students, and local teachers had lunch with Fyodor Lukyanov, Elena Poptodorova, and Daniel Treisman at 12:00-1:30 PM on Saturday, Feb. 21. The First Congregational Church was kind enough to host this gathering, as it has for many past years. This session gave students a chance to take the initiative and set the tone for a free-wheeling exchange of views. Their questions also gave Dr. Lukyanov, Dr. Treisman, and Ambassador Poptodorova the chance to respond to each other’s views and to deepen their scholarly dialogue. Most of our students had never before attended a professional conference, so this session gave them their first opportunity to interact personally with renowned scholars and diplomats. UMO Professor, Paul Holman welcomed the students and faculty. Camden Conference’s Jim Matlack then introduced the guest speakers for the Question and Answer Period.